What Would an Ecclesiocentric Society Look Like? In Your Light, We Shall See Light! The second half of the Hour of Prime is sometimes called the Chapter Office, from the Benedictine custom of reading a part of the Rule of St Benedict at the end of it every day. 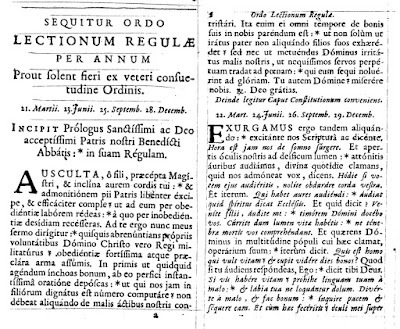 The text of the Rule was divided into roughly 120 sections, and read in order over the course of four months, making for three full readings a year. At Citeaux, however, this reading began not on January 1st, as in most other houses, but on March 21st, which is both the feast day of St Benedict, and the day the abbey was founded in 1098. 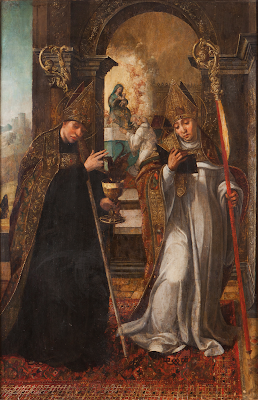 Beginning the reading of the Rule on this day became an annual reminder not only of the Order’s founding, but more specifically of the Cistercians’ role as the “strict constructionalists” of Benedictine monasticism, almost as if to say that the observance of the Rule itself began again with the coming of the new Order. 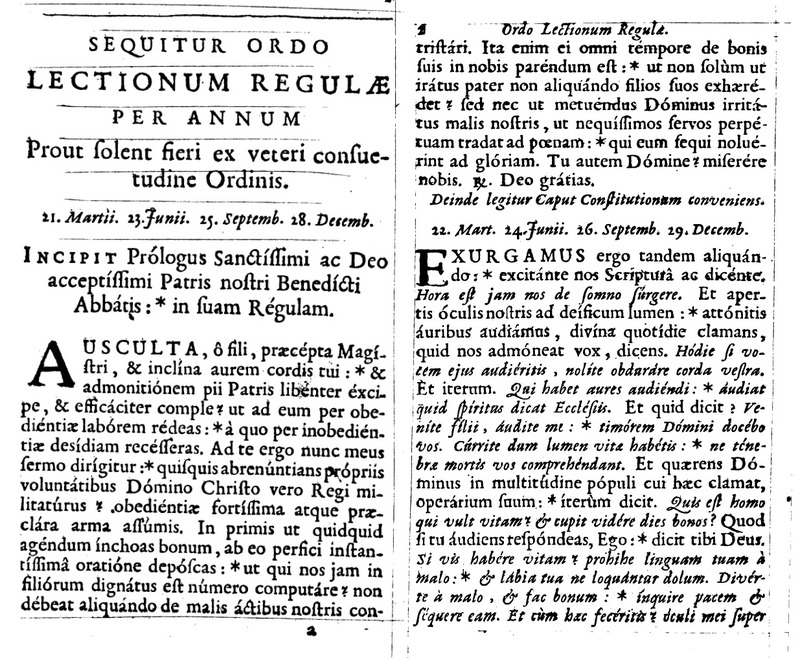 The first two pages of the Rule of St Benedict, with the Prologue to be read on March 21st, from a Cistercian Martyrology printed at Paris in 1689.